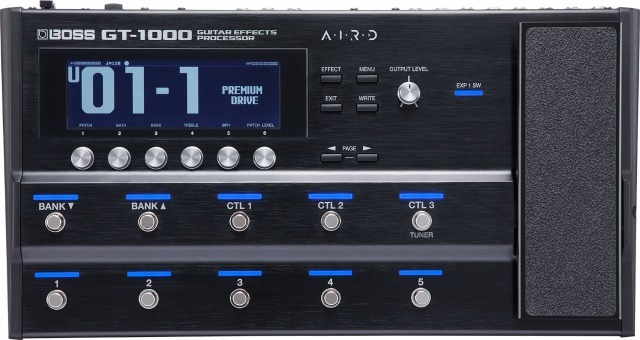 Designed for superior tone and exceptional musical response, the GT-1000 is the first-ever guitar multi-effects processor with 32-bit AD/DA, 32-bit floating-point processing, and 96 kHz sampling rate throughout. Driven by BOSS’s latest custom DSP engine and filled with cutting-edge BOSS technologies, the GT-1000 delivers class-leading performance in a compact and lightweight floor-based unit. The GT-1000 includes a wide range of expressive amplifier types, newly built with the comprehensive Tube Logic design approach behind the acclaimed Katana, Waza, and Blues Cube amplifiers. Also featured is the groundbreaking AIRD (Augmented Impulse Response Dynamics) technology, realized with BOSS’s extensive research into the complex component interactions in classic guitar amplifiers. AIRD provides fully optimized performance with all types of devices, bringing new levels of audio quality, flexibility, and practical usability to this product category. By choosing from a large selection of AIRD Output Select types, users can perfectly tailor the GT-1000 for any destination, whether it’s a guitar amp input, an amp effects return, a power amp driving guitar speakers, or a full-range monitoring system. In addition to the built-in AIRD Output Select types, there are user locations for loading additional selections from the GT-1000 AIRD Output Select Library software. For direct applications in the studio, the GT-1000 features a Recording mode with a variety of built-in speaker and microphone types. Users also have the ability to import WAV-format speaker impulse responses with the GT-1000 IR Loader software. Inside the GT-1000 is an impressive selection of world-class effects, with BOSS’s Multi-Dimensional Processing (MDP) on board along with advanced modulation, delay, and reverb algorithms from the popular 500-series pedals. Users can configure amps and effects with numerous routing options and enjoy mute-free patch switching and delay carryover thanks to the ultra-speedy DSP engine. The GT-1000 offers intuitive editing and powerful control with a large, bright stage-ready display, 10 assignable footswitches, and an onboard expression pedal with toe switch. Via built-in Bluetooth®, users can edit and organize GT-1000 sounds wirelessly using dedicated apps for iOS and Android devices. The BOSS GT-1000 Guitar Effects Processor is available now for $999.99 (U.S. street price). BOSS Tone Studio for GT-1000, the GT-1000 AIRD Output Select Library software, and the GT-1000 IR Loader software will be available in May 2018 as free downloads for Mac and Windows computers.